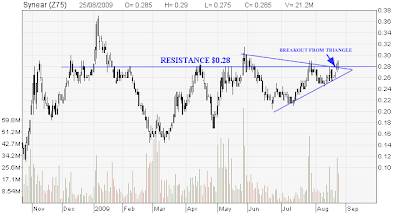 Synear – another stock breaking out from triangle! 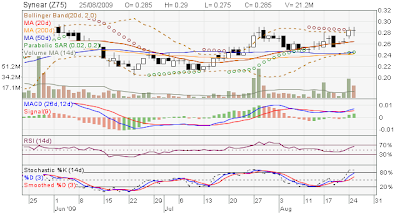 Synear had a breakout from triangle and closed above $0.28 resistance. If the stock price can hold above this resistance line for the next few days, $0.28 will become a very strong support line. All Standard Six Technical Indicators shows Bullish Convergence. Dividend Yield = No Dividend. China Fishery breakout from triangle and looks really bullish!!! China Fishery has a breakout from triangle and close the session at $1.28 with a hanging man candle today. It has chance to go up to $1.422 (161.8% Fibonacci line) and a very strong support at $1.127 (61.8% Fibonacci retracement) with raising volume. All Standard Six Indicators showed Bullish Convergence. 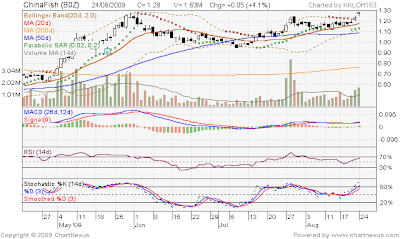 Stock price above 20D, 50D and 200D MA. Stock price at the upper band of Bollinger Band. MACD blue-red crossover at upper half to show bullish convergence. RSI & Stochastic on rising trend. Volume is increasing for past few days and 1.6 million shares traded today. Market sentiment is good today and hopefully will still be good for the next few days. If the stock price can stay above $1.24, short term the stock price may have another 10% upside potential. I will continue to monitor the stock to see whether it will reach $1.422. If all my Technical Analysis goes wrong, I will hold the stock as Value investment and collect dividend because the company’s fundamental is good and the stock is still cheap. Helped out in the INVEST FAIR for past two days, I have a feeling that the talks in the INVEST Fair probably may have some influence over the Singapore Stock market in the coming weeks. There were talks and sharing sessions to show that Singapore stock markets are going to become bearish and having a big correction. The investors who attended the fair have a little bit more insight of the stock market sentiment and the future STI movement. For me, I will stay out of all Blue Chips stock for the time being until the correction is over. I am planning to sell off some penny stocks in the next one or two weeks because any big correction in STI will also affect the penny stocks. The probability of share price going down is higher than share price going up, so why take the risks? Furthermore, the two big drops (5.8% on Monday and 4.3% on Wednesday) last week at Shanghai stock exchange had raised some alarms. I am not going to take any risks.